The small ice caps of Mont Blanc and the Dôme du Goûter are not melting, or at least, not yet. This is what CNRS researchers have announced in the Journal of Geophysical Research. At very high altitudes (above 4200 meters), the accumulation of snow and ice has varied very little since the beginning of the 20th century. But if summer temperatures increase by a few degrees during the 21st century, the melt could become more marked, and could affect the "permanent" ice fields. 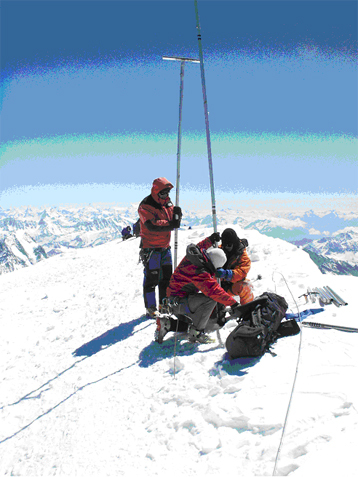 Figure 1 – Researchers from the Glaciology Laboratory taking an ice core sample on top of Mont Blanc, in 2005. © C. Vincent, CNRS 2007. Alpine glaciers, which are mainly at an altitude between 2000 and 4000 meters, shrank considerably during the 20th century and particularly during the past twenty years, losing an average of 1 to 1.5 kilometers in length. However, the situation is different above 4200 meters. At the altitude of the Dôme du Goûter (4300 m) or the summit of Mont Blanc (4810 m), all precipitation is solid, falling as snow. The ice fields melt very little, and only in extreme conditions such as the 2003 heatwave. Variations in the mass of glaciers only depend on the accumulation of snow and the downward flow of the glacier, as the ice is deformed under its own weight. In order to study these mass balance fluctuations, the research team measured the rate of accumulation of snow on the Dôme du Goûter since 1993, and the thickness and flow rate of the glacier. They also used meteorological data from Chamonix, from 1923 to the present day, to calculate the rate of accumulation of ice during the 20th century. Or, more precisely, they used data on the precipitation in Chamonix, altitude 1036 meters, to extrapolate for quantities of snow fallen on the glacier, and so to calculate the mass balance. Based on this data, the glaciologists have shown that at these very high altitudes, the ice mass balance has remained almost constant over the last 100 years. They have also used old topographical maps to show that the thickness of these small ice caps on Mont Blanc and the nearby Dôme du Goûter has only changed by a few meters from 1905 to 2005. By comparison, at a lower altitude (1800 meters), the thickness of the Mer de Glace has decreased by 120 meters over the same period. So the Mont Blanc and Dôme du Goûter ice fields have not yet been affected by climate change. However, during exceptional climatic events like the 2003 heatwave, positive temperatures caused some of the surface ice to melt. If episodes like this were to occur more often, this partial melting would no longer be negligible, and would have a significant effect on the ice mass. So there is no guarantee that "permanent" ice fields will stay that way in the future. Very high-elevation Mont Blanc glaciated areas not affected by the 20th Century climate change, C. Vincent, E. Le Meur, D. Six, M. Funk, M. Hoelzle and S. Preunkert, Journal of Geophysical Research, May 2007.Vol 112, D10.